You might think of the Facebook messenger purely as a communication tool to stay in touch with your friends and family. However the Facebook messenger is one of the best marketing platforms out there, today! In this guide we will explore together why and how you can get started leveraging the huge potential the Facebook messenger platform holds! We all know that the digital world is c﻿﻿han﻿﻿ging rapidly. 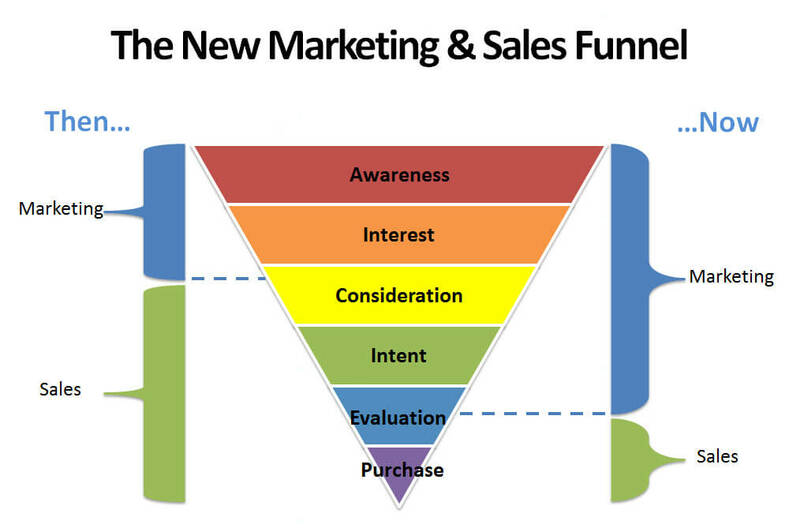 But let me show you how fast it is actually changing and what this means for marketing. Technology is being developed in such a pace, that by the time something is actually released it might not even be relevant anymore. 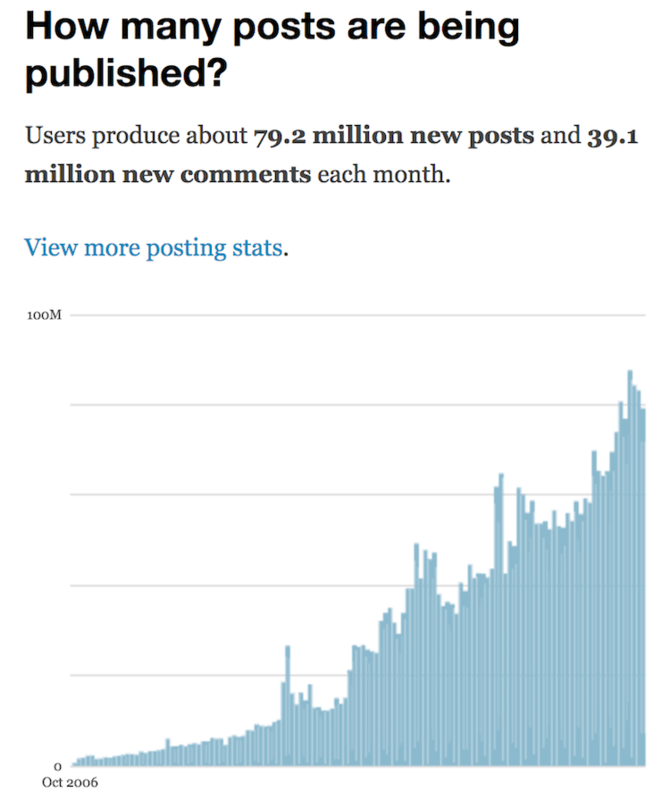 For example, everyday between 2 and 4 million blog posts are written, that are more than 2000 new posts every minute. By the time you publish your article, the knowledge you are spreading might already be irrelevant! Wow. But what has that to do with marketing for the Facebook messenger, you ask? There are 3 ﻿million﻿ advertisers on Facebook! Given the amount of businesses today, that is only a fraction. That shows that there are still a lot of businesses just getting started with digital marketing! If you, yourself are just getting started today, or if you have started some time ago you are probably concentrating most of your budget on channels such as Google Adwords, SEO or even Facebook Ads! But the reality shows, that with the extreme growth of mobile devices messaging apps have now even surpassed the long time prominent social networks! In fact, we spend most of our time on messaging apps and the usage of other apps, even Facebook has dropped comparatively. This is why, you need to step up your game and get started with Facebook messenger marketing today! 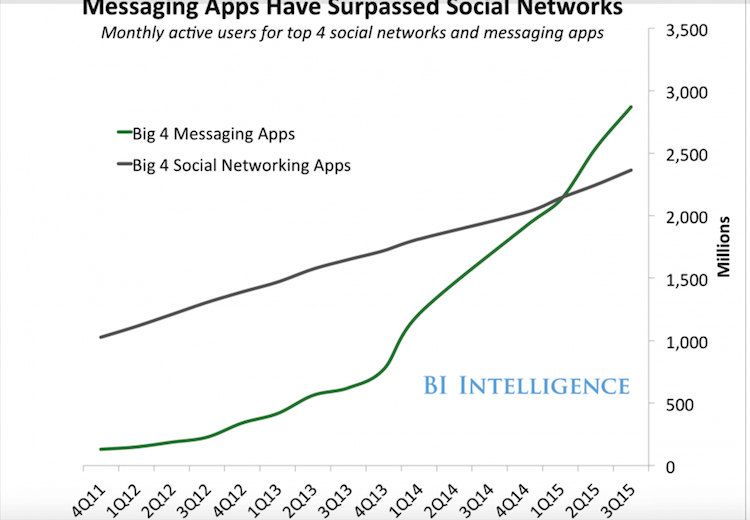 With the growth of Facebook itself one on one messaging became more and more important over time. At the same time, the usage of mobile phones has grown rapidly and the need for a lean and standalone messaging app arose. In August 2011 Facebook initially released the Facebook messenger app. Like with (almost) every new release that brings change to something we are used to, the public had mixed feelings at the beginning. Today, the Messenger counts 1.2 billion (April 2017) users! That is a tremendous growth over the last years. 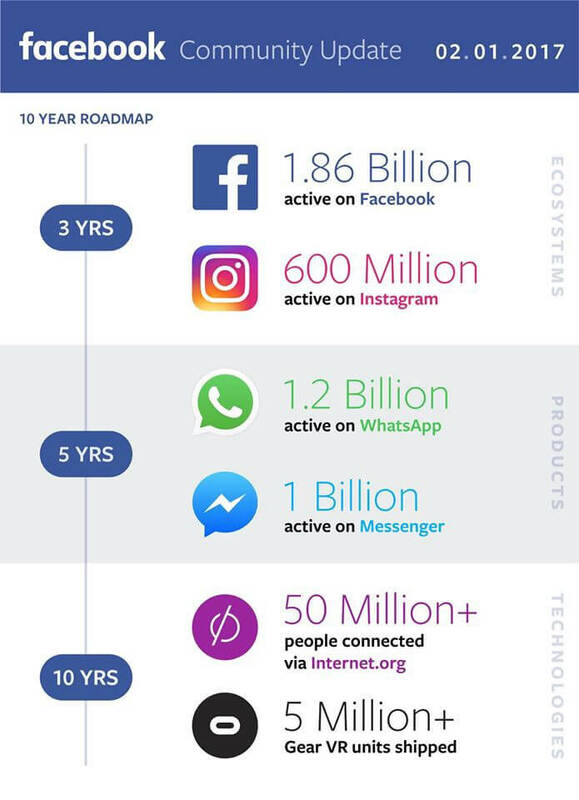 As you can see the platform itself with its 1.2 billion users is massive, which means that most likely your target audience, that you can also reach through Facebook is also active on the Facebook Messenger. 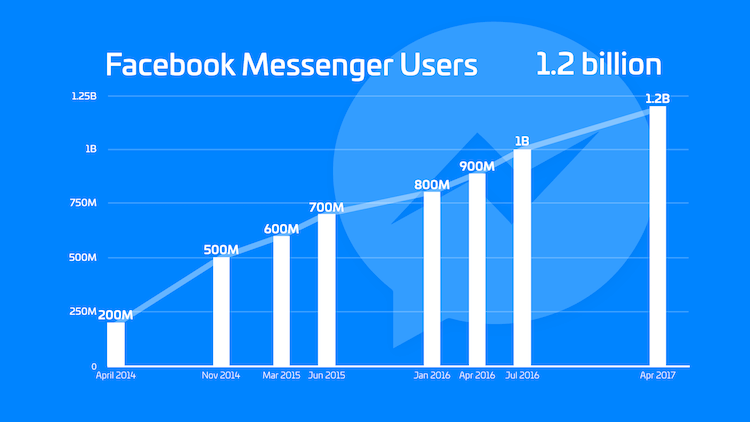 But it’s not just about the amount of users being active on the Messenger, instead it is more about the usage of the messenger. Currently email marketing is viewed as one of the most effective marketing channels, because you are directly interacting with your audience. Today this trend is changing, emails used to be viewed as very personal, however with the massive amount of emails sent on a daily basis, people started to see emails as a means of promotion. In contrast to that messaging apps and on the forefront the Facebook messenger still portray an untapped potential for marketers. 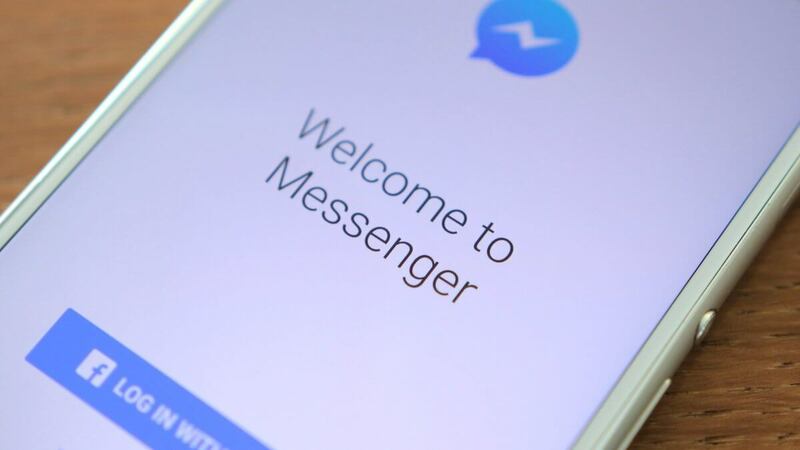 The Facebook messenger is viewed as an app of personal interaction which allows you to interact with your target audience on an even deeper and more personal level than ever before. Let me explain, why this is so important. First of all we basically carry our cell phones with us 24/7. The Facebook messenger app and other messaging apps, take up most of our time spent on mobile devices, which means that when we check our phones up to 157 times a day we spend most time in our messengers. 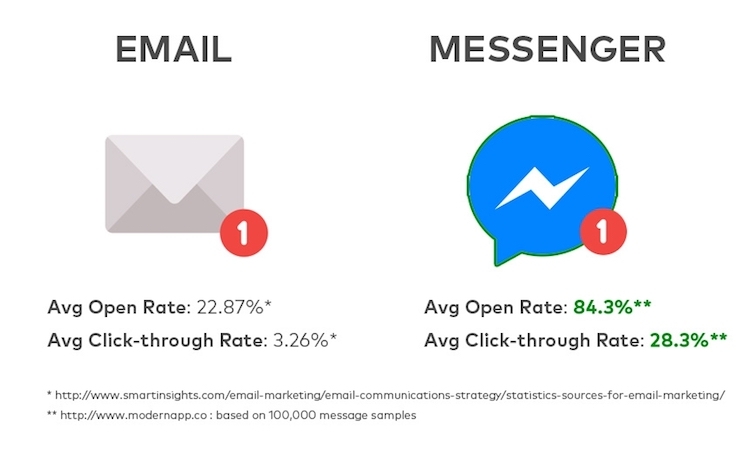 Once you understand how personal the Facebook messenger is to people, you also won’t be surprised, that message open rates are 700% higher than on emails. Now that we know the hard facts, let’s dig even deeper to understand why marketing on this messaging platform is so important for your business. Most of this goes back to two of the most important principles of marketing! Branding and understanding the customer journey! Today most people have more than one email address. 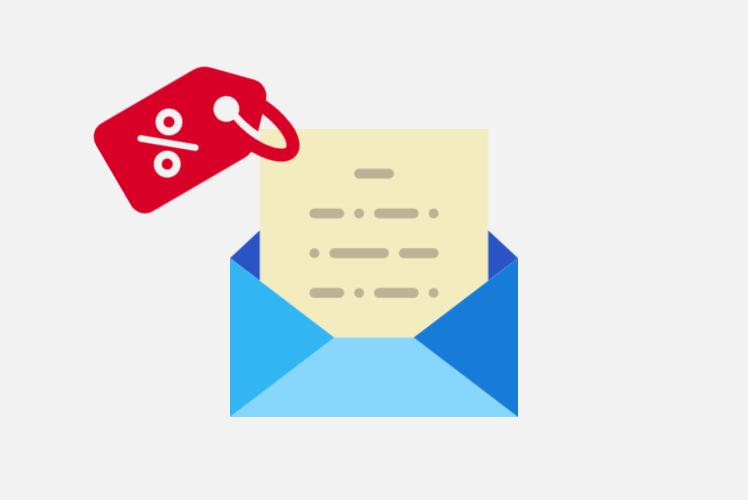 Quite often people use their second email address to sign up for services they want to check out but are not really interested in the company's content or brand. With Facebook messenger, that is a bit different. Although Facebook reports up to 83 million fake profiles, most people will use their real profile to interact with friends and businesses. This means, that when you are able to generate Facebook messenger subscribers you really managed to win the trust of people. Winning the trust of people you want to sell to, is the most important task your marketing has to do! Now, we are also able to turn this thought concept around. Let’s say you do not already have a big brand but you want to get started with the Facebook messenger. By proactively generating messenger signups you subconsciously plant yourself as a trusted resource in the mind of your subscribers. People that signup to your Facebook messenger, will by default start trusting you more. This is a phenomenon called cognitive bias or also post-purchase rationalization. Which is the tendency to retroactively ascribe positive attributes to one's choices. So as you can see making use of the Facebook messenger in your marketing mix is tremendously important and can hold a great benefit for your business. Now let’s dive deeper in how you can actually get started with Facebook messenger. As it always is with anything you do, you need to make sure people see it! The same rule applies to your Facebook Messenger Marketing. Now first you need to know, that as soon as someone starts massaging your business on Facebook, you right away are in personal contact with that person and you can send them personal messages. Ok great. Now it is time to actually start setting eyes on our main goal. Driving lots of traffic to our Facebook messenger, so more and more people start interacting with us. 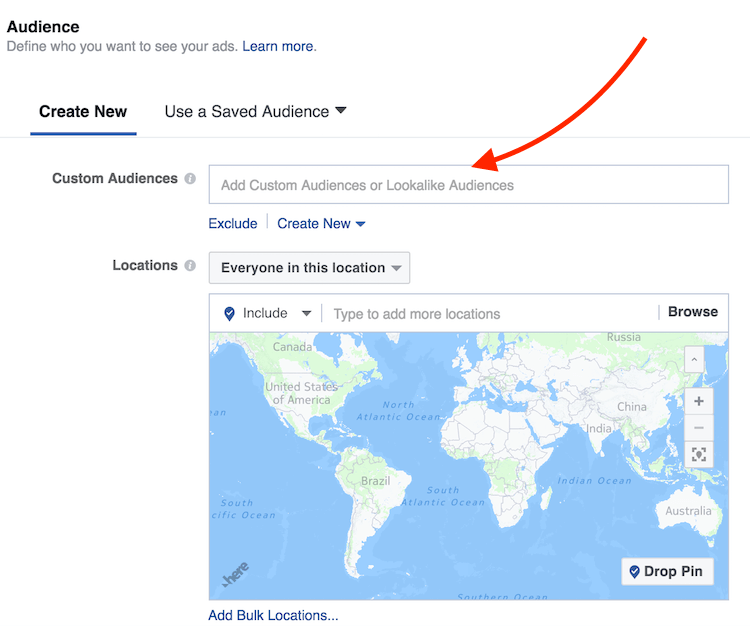 The best way to do that is by creating a targeted ad on Facebook. Head over to your Facebook business manager. And then open your ad manager within. Create a new campaign. 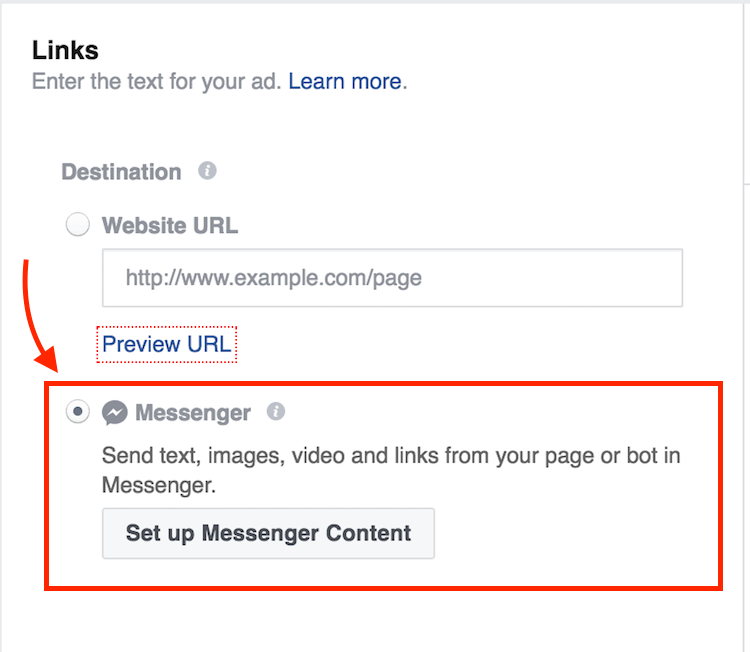 To be able to create ads that direct to the Facebook messenger you will need to select “Traffic” or “Conversion” as campaign objective. In the next step, we need to select the target audience. I have found that, especially with messenger ads, retargeting ads to an audience that has recently read one of your blog articles or has visited an important part of your website works quite well. To do this choose a custom audience and select blog post readers. After you have narrowed down your target audience that you wish to see your ad, it is time to create your ad itself. First select that you want to send traffic to your website or messenger. Next, head over to your ad creation setting and instead of adding a final website URL we choose messenger as destination. 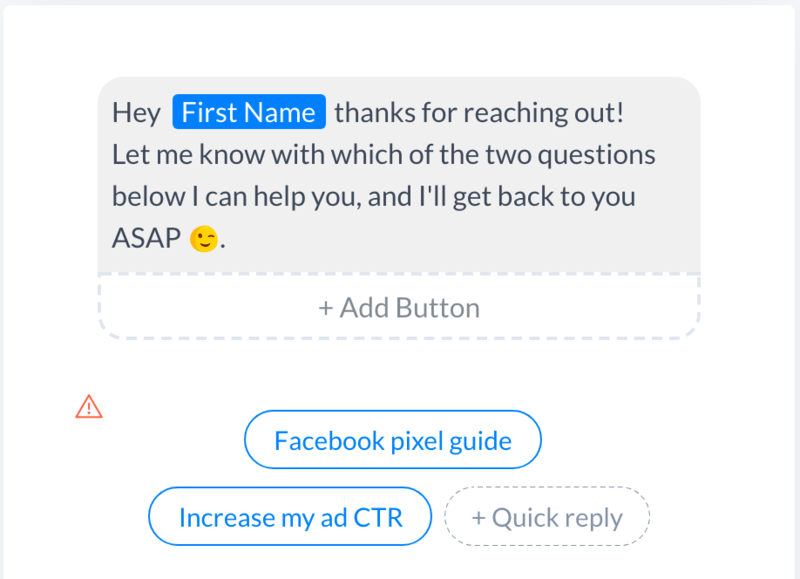 After you have selected the Facebook messenger as the destination of your ad, you will need to define an automatic response sequence you want to greet people with after they click on your ad. 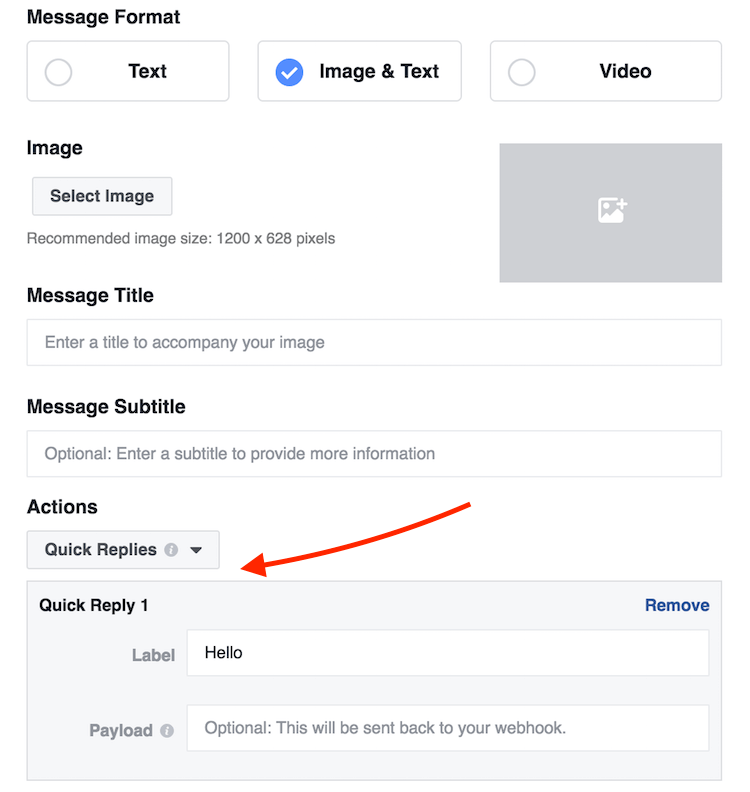 In the messenger content section you can define some quick responses from which users can choose or you can also add buttons that will direct people to certain links. Keep in mind, that the goal of this campaign is to create a personal relationship with people by having them send you a message through Facebook. This means, that you need to give them a valid and good reason why they should even send you a message. So here we need to work on our offer and ad copy. What I found to work like a charm for such retargeting campaigns, is playing it really transparent. And just right out asking people if they have any questions regarding your content. And if they do, now is their chance. Just make sure, that you are actually able to respond to the flood of messages you will receive ;). Great! 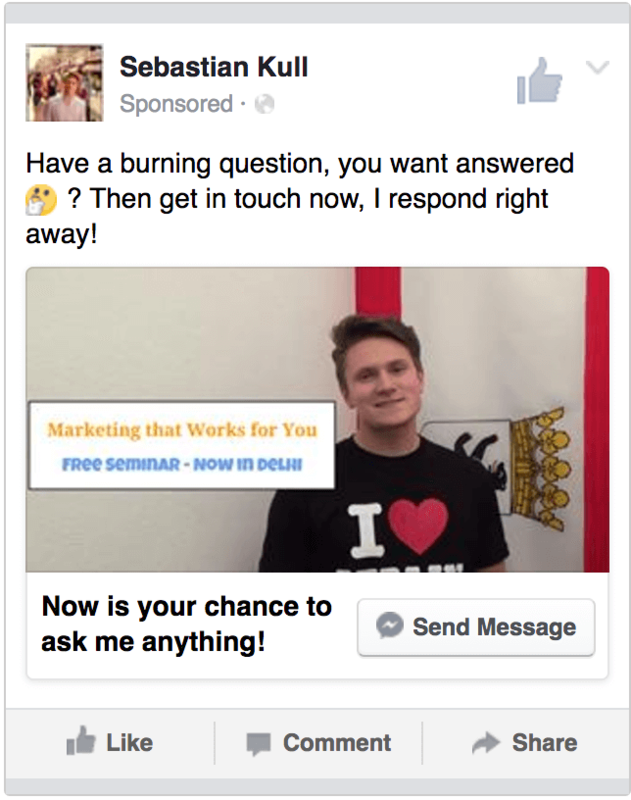 Now we have created our first Facebook ads, that push traffic to our messenger. But now it’s time to figure out how we can engage them and build a relationship over time. Of course you can start chatting with each and every of your leads in person, however I don’t recommend that if you are looking for scalability and maximum impact. Now here is what we do. We’ll make use of one automation tool. Currently my favorite one is ManyChat. 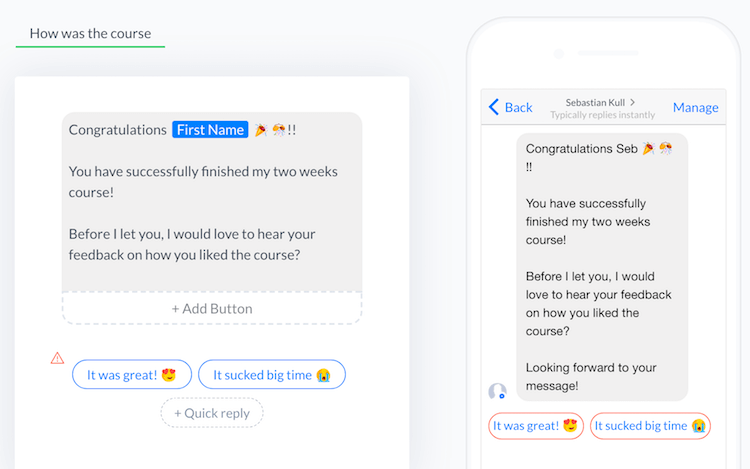 This tool allows you to automate certain processes and even set up a basic chat bot, that will engage with new Facebook messenger leads. First head over to the website of ManyChat and create a new account. 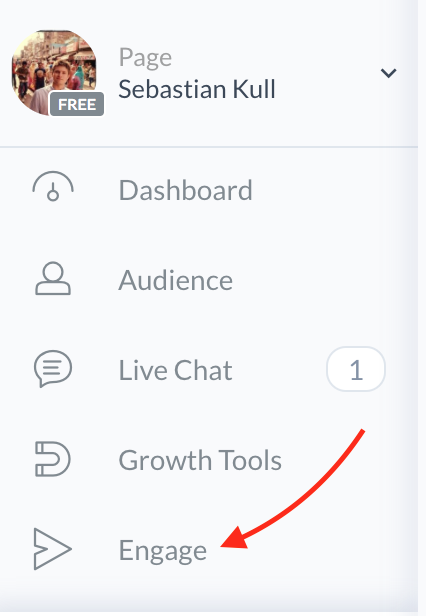 Once you have logged in and connected your Facebook page to the service, you will reach the default view of the tool. 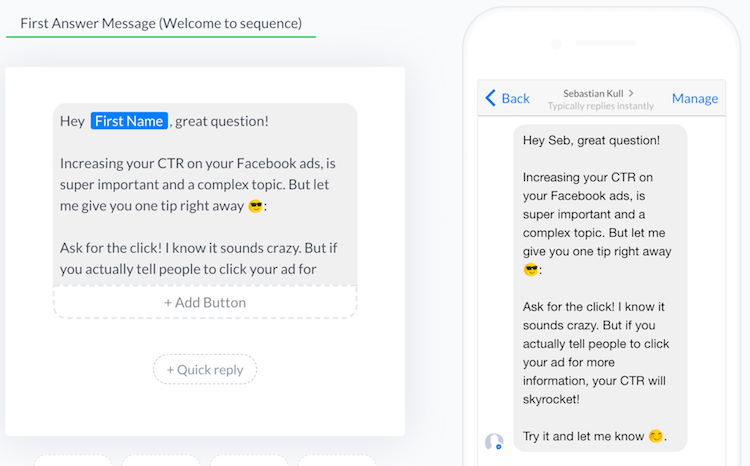 While the tool itself offers quite a lot of different options to optimize your Facebook messenger marketing communication, I will focus on the automation section here. On your very left navigation bar scroll a bit down and click on automation. Then click on sequences. 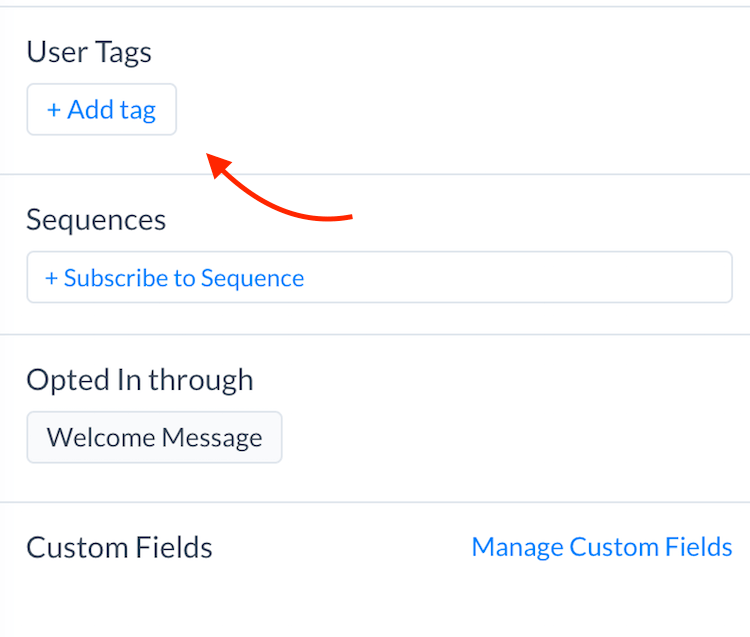 In your sequence overview, you will find one templated default sequence flow. You can click on it to either start using it or to simply get an understanding of what is possible in ManyChat. In this case however, we want to create a new messaging sequence. Click on new sequence in the top right corner. Give your new sequence a name, that in the best case describes what the purpose of this automation is. 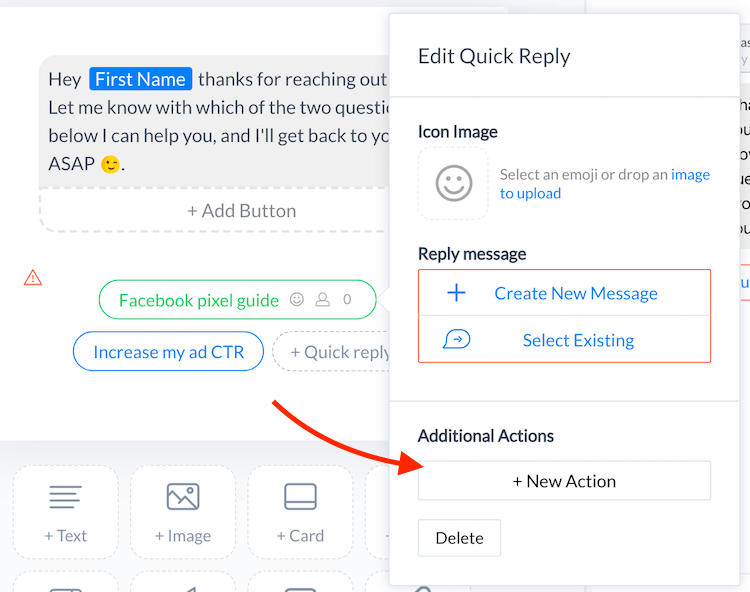 Now, after you have clicked on create, you will automatically see one default messaging sequence with 5 different messages in it. We can either modify each message or delete all of them and start from scratch. Of course, we start from scratch :p.
The first thing we want to do after we have deleted the templated messages, is create a new message. We then have the option to choose between an existing message or create a new reply. We click on create new reply. The following screen is one of my favorite ones, we can now choose between a variety of different answering options. As this is our first welcoming message to new subscribers, we want to keep this message personal and in context to our ad, which we have created before. Now at the same time, we have to make this message interactive. The Facebook messenger, as every messaging tool lives from personal conversations. 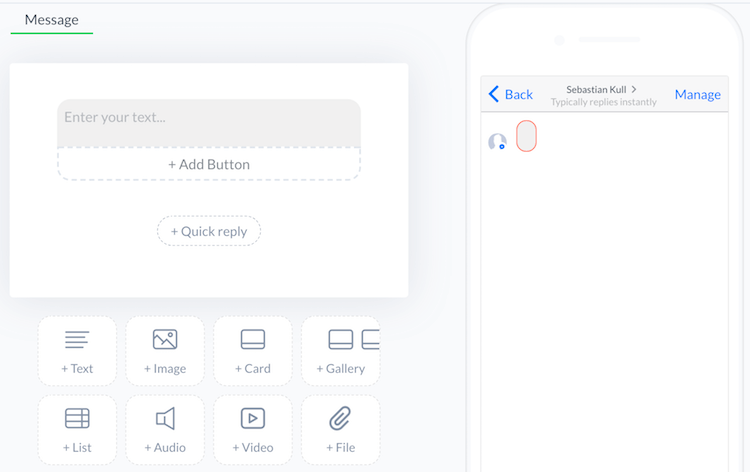 But to be able to actually scale our processes which do not require us to directly interact with people all the time, we need to predefine some smart replies that let us automate and control the interactions with our subscribers. While we create our first interactive messages it is time to bring some logic right into it.As you remember from above, we have pushed people into our Facebook messenger by asking them if they have any more questions about the content they have read prior on our website. Now the trick is to predefine the possible questions they might have. By doing so we have the option to trigger further sequences that are tailored to answer the questions they might have. To do this, we need to add two quick replies to the previous message. Then, we can link a custom action to each button click. 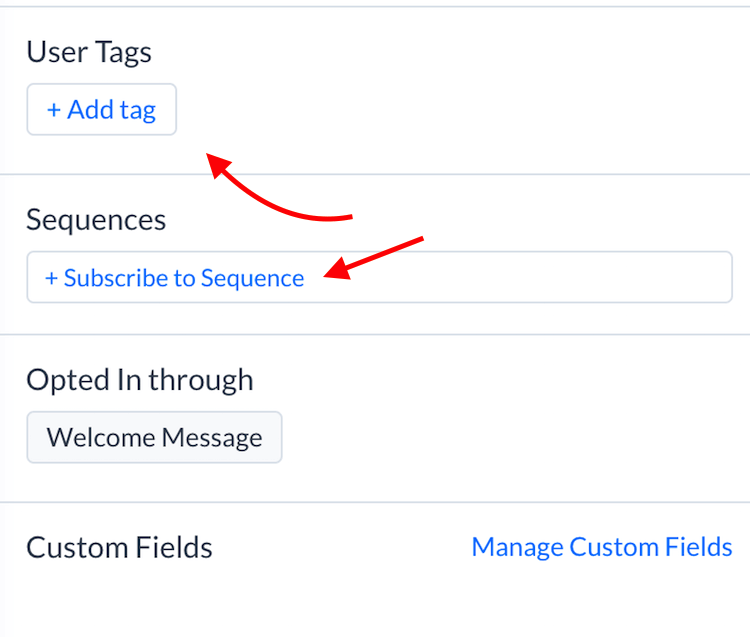 In this case, we want to add users to a new sequence based on their selection. Great. Just like that we have created two different segments within our messenger leads. Which we can now nurture through a series of different messages. In this example let’s concentrate on one segment for which we are going to create an automated messaging sequence. We are going to chose the segment that is interested in increasing the ad CTR. First, let’s concentrate on the logic of our new sequence. We have already segmented our leads into two different sequence flows, so we can go ahead and actually provide all the information they need. The first message we want to send is a straightforward answer to the question our leads have selected. Here we want to provide as much information as possible in one message. However remember, that we are sending Facebook messages and not emails, so we need to keep our texts short and to the point. This message is going to be a teaser but also already laying the ground for what is happening over the next days. In this message, we will pitch that we are going to send an educational course of 7 educational messages with different content over the next 2 weeks. Note, that is is important to send this message almost immediately after the first message, because otherwise people will start to respond to your messages and wonder why you are not replying in real time. You might wonder, why we are saying 7 messages over a course of two weeks? Let me explain. A lot of numbers are influenced by some mystical believes, depending on the culture you are living in. 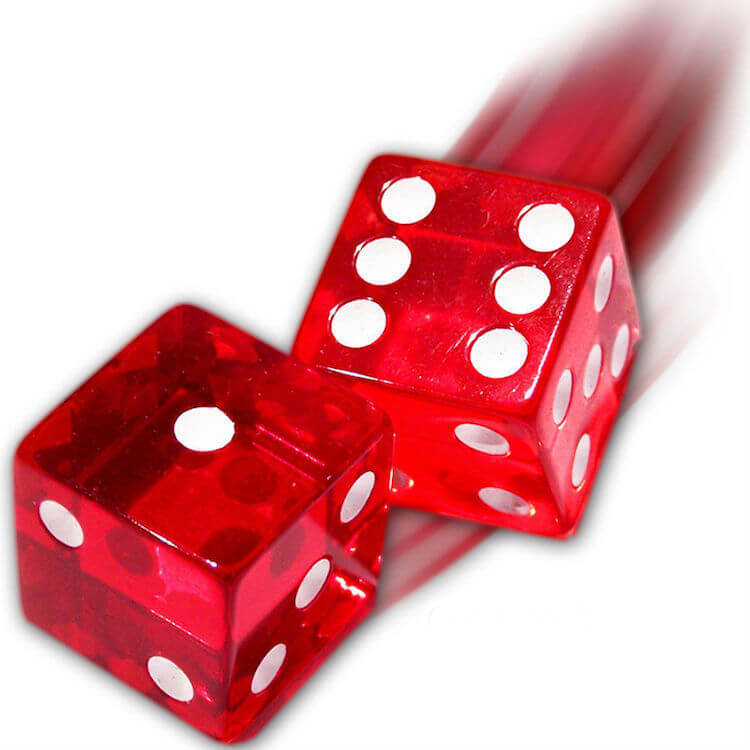 For example in western countries the number 13 is commonly associated with bad luck. In east Asian cultures it is quite commonly the number 4. Because it’s pronunciation in mandarin and korean for example sounds similar to the word of death. In general we also find odd numbers are a bit frightening and we prefer even numbers, however with the number 7 this is a bit different. Different studies have shown that a lot of people name the number ﻿﻿7 as their favorite. This might be rooted in the many different associations with luck, being mysterious or just the fact that it’s a prime number. So, if most people seem to love the number seven our odds are high, that people in our messenger lead list like it, too. Which will again increase our retention rate, I’d say. Now the period of two weeks. Here it becomes a bit more magical ;). We select the period of two weeks, because we are leaning on the work of Hermann Ebbinghaus, who was a German psychologist. In particular, I am referring to the so called forgetting curv﻿﻿e. 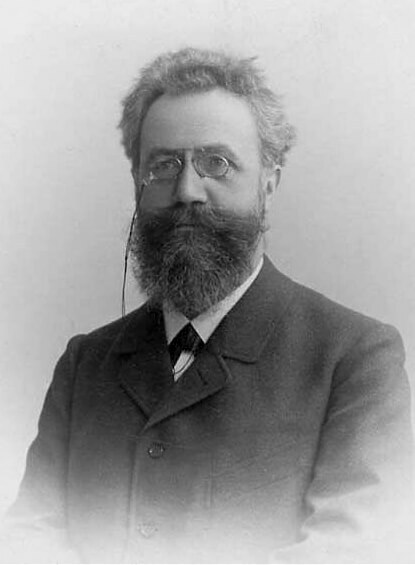 In his experiment Ebbinghaus found that after an initial exposure the time in which we are exposed to a fact again needs to be much higher initially to ensure we are not forgetting the information. He suggested that we would need to review information every 24h at the beginning to reduce memory loss. In this case we mainly want to achieve that your leads do not forget about you! If we combine that study with our knowledge of the number 7, which fits twice in 2 weeks (14 days). It seems like a good and friendly period of time to get to know people really well, and let them get to know you even better! Alright, but now let’s continue. This will be our series of educational content, stretched over 2 weeks. In this series we will further educate our leads on the topic of the initial questions they have had. To do this, you can for example take the content, which you would have usually used in a webinar and split that over those messages. Alternatively, you can also use a series of blog posts which are building up on each other. Or even take one long form blog post and split that one up. Make sure to keep the messages short, to the point and knowledgeable. You can also include links, images or short videos. This will be the first message after the educational course. Here we basically want to check in how people liked the course and if it provided any additional value. Again we can make use of predefined answers to reduce individual replies. Now it’s time to start pushing people towards the sale! We do that by starting to pitch the USPs of our product which is of course building up on the free course we just provided. At the end of the message we can place a link to our sales page. This is a follow up message after the initial sales message. This is also going to be the last message of this sequence. In this message we will place again the link to our sales page with a last offer. We are also going to ask an open question in the end, just in case people do not convert. People that are not yet ready to buy, are able to respond which puts them in contact with sales directly and you are able to convert those leads manually, if needed. Working with automated sequences in Facebook messenger is fantastic, but that is just one of the use cases! Another option how you can use your Facebook messenger is to send out so called broadcasts. 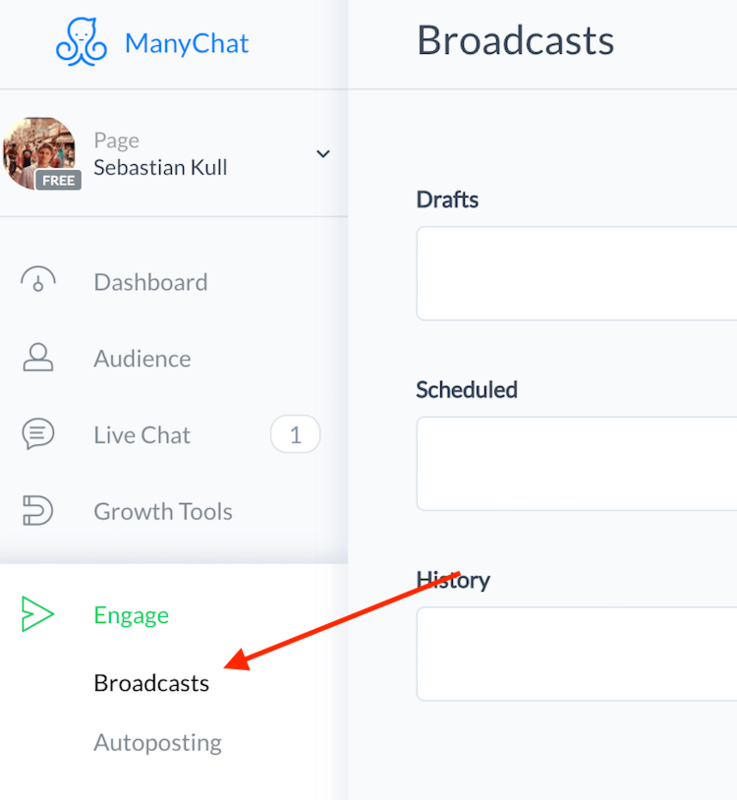 Broadcasts are basically one time messages that are sent out to multiple people at once. There are a couple of different angles you can take when thinking of broadcast messages. First, you can think of it of replacing or duplicating your classical email newsletter. Second, you can basically start going crazy with ideas :p. Keep in mind that the Facebook messenger is one of the most personal communication platforms out there. So you will be in direct contact with all of your leads or customers. Besides newsletters you can use such message broadcasts for surveys, company announcements or invitations to sweepstakes. My favorite option is to simply push qualified traffic to new blog articles, which will then push those leads into new sales funnels. Let me show you how to set up such a broadcast. Again, we are going to use ManyChat to do this. This time, we will navigate to the tab called “Engage” on the left hand navigation. Once there, click on broadcasts. You also have the option to automatically keep on posting, which is quite handy if you want to save yourself some time. In the broadcast section, click on New Broadcast, in the top right corner, to get started. Next, we are able to write the message we want our subscribers to receive. In this case, we will quickly send them a heads up about our new blog article and insert a link to it. After you have created your message you want to click on next. 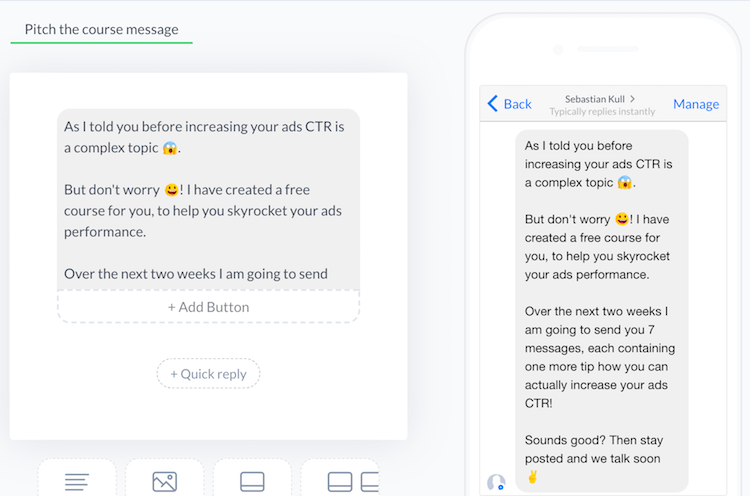 On the following screen, we have a couple of different targeting options, that allow us to narrow down the message we want to send as closely as possible. First, we can select the message type. In this case we go for the subscription broadcast, as we want to reach people that we have on our list with an educational message. Secondly, we can even further narrow down the targeting. 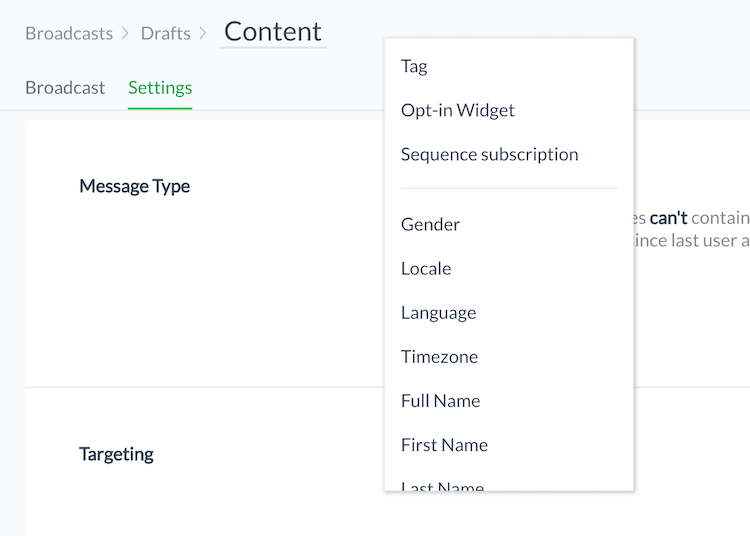 We can filter by a variety of options such as language, timezone, gender or even name. Besides that we also have the option to go by tags, which we have assigned to people on their signup. Thirdly, we can go by a selection of different sending options. We can either send the broadcast right away or even schedule it. We are also able to send the messages at specific times based on the time zone people are in and select the way we want to have our message pushed to the devices of our subscribers. Once we have made our choices, we can quickly preview our new broadcast and once all seems fine, we can hit send and push it live. One of my favorite topics to talk about is the integration and alignment of marketing, sales and customer service. In today’s world in which the user is presented with a platter of different options to choose from it is essential to provide the best experience possible in order to ensure people choose you. Too many times I have seen a harsh break in companies when people pass through the different stages in the customer journey from lead to prospect to customer. Such disrupting experiences are bad for your customer and make them wonder if they even want to stay with you. 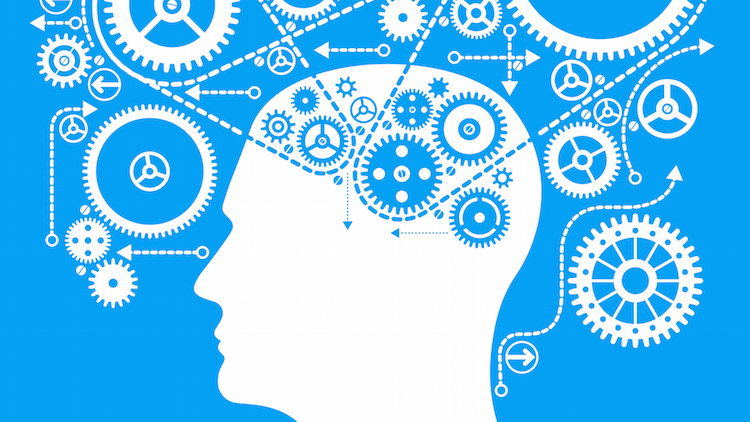 Today, we as marketers need to think differently and dive even deeper in the customer journey. The Facebook messenger itself offers a great platform to do so. Only in rare cases we marketers have ever been so closely connected to one single person. In a situation like this, where we are basically texting our potential customers we want to ensure that their experience is as smooth as possible and they do not experience any hiccups along their own customer journey. What does that mean for you? Well, you are probably familiar with some very frustrating customer support flows, when you wanted to get in touch with a company, but instead of making it easy for you, you would need to actually try to call four different numbers until you eventually reached support! With the Facebook messenger we have marketing, sales and customer support tool in one! So do not try to move your customer into another environment if they want to talk to sales or support. Instead you can manage all of customer touchpoints right in the Facebook messenger. Now, let me show you, how you can do that. Again ManyChat will be of help here. Let me walk you through it. Head back to your ManyChat tool. Then navigate to the tab called live chat in your left hand navigation. 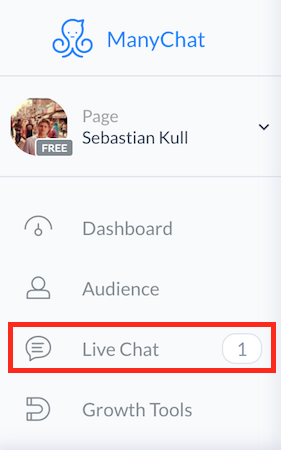 Once in the live chat, you will see all people that have actually responded to your marketing or sales messages. Those people are now put into a live status and are waiting for response. You are able to manage and organize your leads through different tags. Like this you can keep track of the different stages people are in and even what inquires or request they might have. Start engaging with your audience. Now all you want to do is actually keep a conversation flowing. You are able to directly respond to messages through ManyChat. 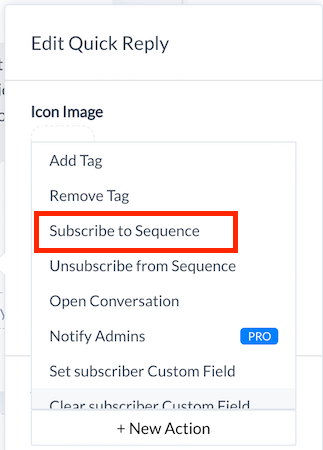 The tool also gives you the ability to either add new tags and also to subscribe people to new sequences. This option is very helpful. Let’s say you have just manually converted a new customer, you can directly place that person in a customer onboarding sequence. 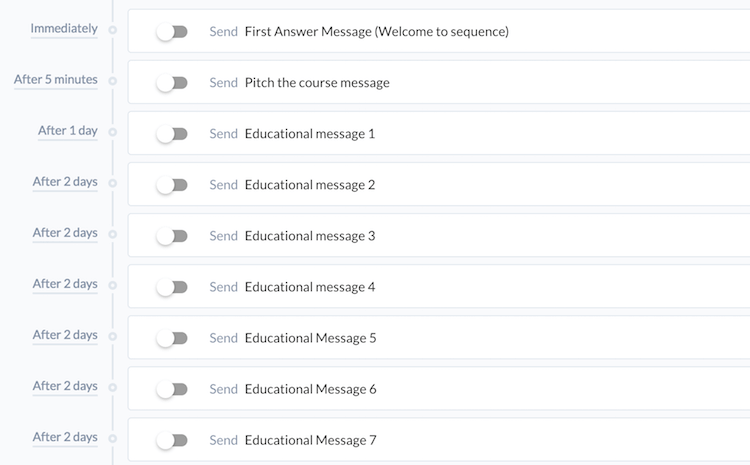 Or if a person has questions about a certain topic, you are able to directly assign them to an education sequence right out of ManyChat. If you are not quite sure yet if it even makes sense to allocate more resources towards the Facebook messenger and you are worried that this might just be a hype, then let’s look into the future of what could happen to the Facebook messenger in the coming months. While we can take a look at the Facebook roadmap numbers itself, that will only give us a fraction of what will or might be possible in the future with the Facebook messenger. If we really want to determine what might lay ahead, we need to look towards China. In particular at the software called WeChat. Almost everyone in China with a mobile phone uses WeChat. This software is like the Facebook Messenger and Whatsapp combined and even more. Instead of just focusing on messages, calling or gaming WeChat already provides an entire ecosystem through which people are shopping and paying online and offline services.You can even order and pay for your food in restaurants through the platform. If you have seen the potential of such an ever-integrated service you can very well imagine where the Facebook messenger is headed. With the introduction of Facebook messenger payments, Facebook is already taking a big step towards that direction. So now is the time, more than ever to get started with marketing on the Facebook messenger. Marketing came a long way over the last years and decades! 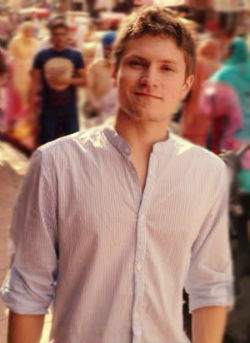 At the beginning, years back, we started broad interacting with a broad mass of people. Then we became more personal. Facebook and Google Adwords allowed us to target users even better on either their personal profile or what they are looking for. Then we have advanced email marketing campaigns, that allow us to send personalized mails. But today, the Facebook messenger is ringing in a new age of personal communication! Us marketers now have the power (and responsibility) to tailor fitting marketing messages even more personalized than ever before! 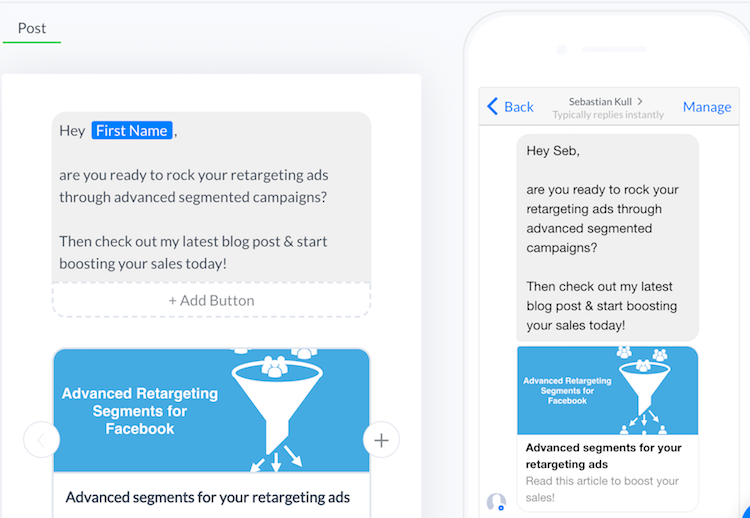 So now it is up to you to get started with Facebook messenger marketing and and create even more successful personalized marketing campaigns that deliver real results!